What a wonderful (if rainy!) bird walk this morning in Glen Providence Park! Spring migration did not disappoint – led by Al Guarente, we identified 45 species of birds. The additions of Pine Warbler, Common Loon, and Yellow-billed Cuckoo bring our Park Bird List to 123 species! Other highlights were a Spotted Sandpiper at the pond, Baltimore Oriole, Rose-Breasted Grosbeak, Ovenbird, Veery, and of course hearing the ever-lovely Wood Thrush. Thank you to Al Guarente of the Birding Club of Delaware County for leading his 6th(!) 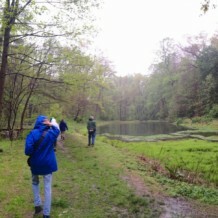 bird walk for us, to Dave Eberly for joining us, and to the intrepid birders who joined us on a cold and rainy morning.